Adds, subtracts, multiplies and divides hours and minutes which is useful for filling in timesheets or using to sum the play time of your CD collection. A mixture of time (e.g. 07:24) and decimal (e.g. 7.4) format numbers may be specified. The result is always in time format. Simply click the convert icon to convert between time and decimal formats. Use the number and function buttons to enter the desired time calculation and press equals to display the answer e.g. 7:24 + 1.3 = 8:42. The memory function M+ will add the current value to the memory result while the M- button will subtract the current value from the memory result. Neither of these buttons affect the LCD display. The MR button will blank the LCD and display the memory result. The MC button will clear the memory result but does not change the contents of the LCD display. The red M in the top left corner of the LCD display indicates you have something in the memory. Click MC to remove the M.
The Min-Dec icon on the right of the display converts between time (e.g. 7:24) and decimal (e.g. 7.4) formats. If the time cannot be exactly represented in decimal then it will be displayed with a remainder (e.g. 7:25 will be displayed in decimal as 7.4r1). Converting a result with a remainder back to time format ignores the remainder to give you the nearest time that can be converted to decimal. The CE button blanks the LCD and displays the last result. The C button blanks the display. 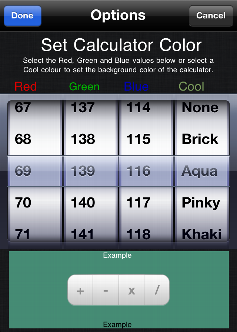 Click on the "i" button to display the Options screen where you can select the background colour of the calculator using either the RGB wheels or the predefined "Cool" colour wheel. The colour you select is previewed at the bottom of the screen so you can see what it looks like without having to return to the main calculator screen. 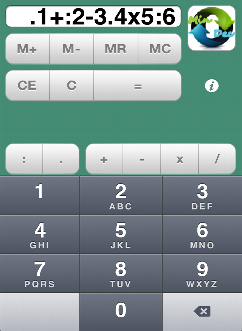 Click "Done" to return to the main calculator screen. The colour change you make to the background is remembered even after powering the iPhone off. Please note that when incrementing or decrementing a single R, G or B value then the colour change may not be noticeable although that colour is displayed on the screen.